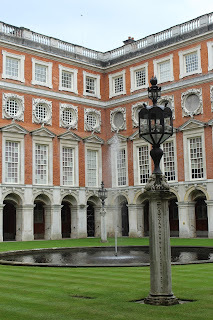 What can I say about Hampton Court Palace? Well not much.... I found this day trip rather boring. But if history and palaces that have been transformed into tourists sights with projection screens, fake meat, and sound effects of chopping that fake meat is your thing then by all means! Oh and actors pretending to be King Henry VIII or whoever and all of his many wives who never gave him a son, heaven forbid!!!!! Anyway I had my camera so I took some pictures. I was especially fond of the ceilings and murals however the murals in the church were the best but photos were not allowed. This palace was also filled with beautiful courts and gardens. This place was just massive! The palace also had a room that had guns on top of guns on top of guns on every single wall! Now I personally hate guns, don't see the purpose, and only think a fool would own one but the guide told me that this room was designed with a purpose. That purpose was not to symbolize violence but actually the opposite. And then of course the ceilings!! !